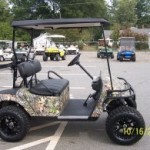 We’ve customized hundreds of custom golf carts for our customers, and look forward to adding you to our long list of happy clients in Hickory, NC. 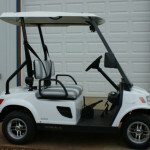 Custom Golf Carts in Hickory – You enjoy everything about the days you spend at the golf course. From the beautiful weather we have here in Hickory, North Carolina to improving your golf game, if it was up to you, you would spend every day hitting golf balls. 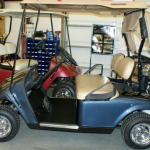 If you don’t think that the game of golf could get any better, at Golf Cars of Hickory, we’re here to tell you that it can. 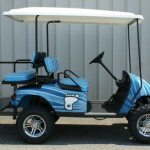 With a custom golf cart, you can say “goodbye” to the standard white ones that are out there and “hello” to a completely unique one that’s all your own! 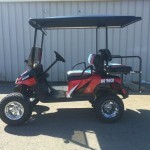 We’ve customized hundreds of custom golf carts for our customers, and look forward to adding you to our long list of happy clients. 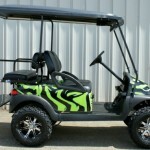 What Makes Our Custom Golf Carts Stand Out? 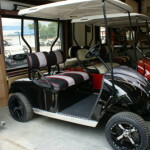 The main thing that sets our custom golf carts apart is the fact that all of our work is done in-house. 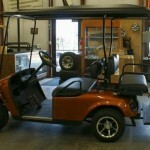 We do this to ensure exceptional quality and to keep an eye on every stage of the customization phase. 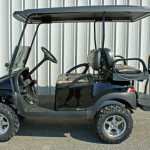 This way, we’re able to prevent unnecessary issues and ensure that every custom golf cart we work on goes above and beyond the expectations of our client. 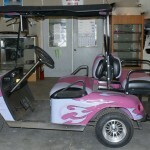 Additionally, when we say that our custom golf carts are custom, we really mean it. 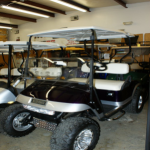 When you work with us, you can pick out what you want the paint job to look like, whether you want to add a lift kit to your golf cart, the type of seats that go in your golf cart, the way the steering wheel looks, and much, much more. 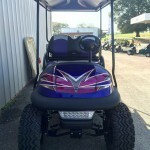 The sky really is the limit when you let us customize a golf cart for you! Which Features Should You Choose? 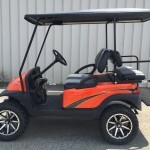 When it comes to custom golf carts, we realize that with all of the different options out there, it can be difficult to focus on one idea and come up with a plan for your golf cart that really exemplifies your style. For this reason, we encourage you to start the process by thinking about your personal style. 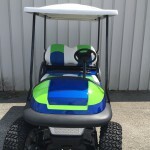 Is it more sporty and bold? Or, is it more traditional and elegant? Defining your style will ultimately help you know which direction you want to take the customization process. 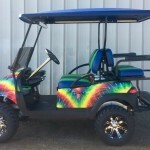 After you’ve nailed your style down, think about the features you’ve seen in other custom golf carts and which ones you like best. 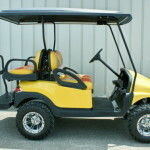 Then, prioritize which ones you want in your golf cart the most and which ones you could live without. After you do this, you’ll be more than ready to put your customization plans into action. 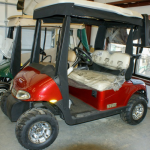 At Golf Cars of Hickory, we can’t wait to help you customize a golf cart you’ll take out on the green for many years to come. 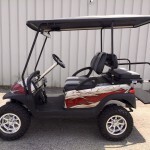 Feel free to give us a call if you have any questions, or come take a look at some of the custom golf carts we’ve worked on in the past to get a better feel for what we can do. We can’t wait to get started! 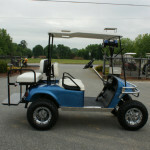 If you are looking for a quality custom golf cart in and around Hickory, NC, look no further then Golf Cars of Hickory! 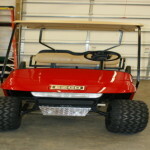 Custom Golf Carts in Hickory – Here are just a few examples of our custom built golf cars. We do all of our work in house. 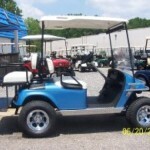 Let us build your golf car for you! 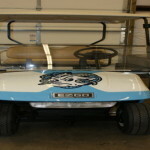 Custom built EZ-GO golf car. 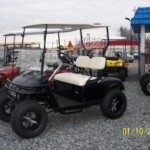 Price will depend on the year of the golf car and which options and accessories you choose. 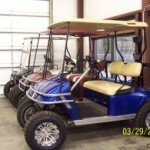 We can custom build to your specifications. Please call for quote. Check out our current models below. See more in our new model gallery. Margarita Theme! All Paint…no stickers or decals! This one won’t last long! Upgraded 600 amp on the fly controller. 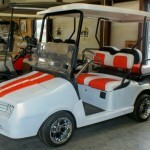 Custom Golf Car This golf car has custom body. 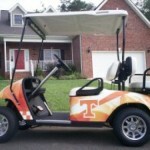 We can customize to any team logo. Options are wide open on this one. 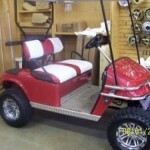 Price will vary depending on just how custom you go. Call for quote. 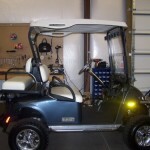 *SOLD*2004 E-Z-GO Freedom Golf Car with custom blue/metallic paint. 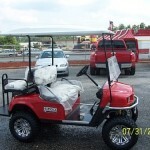 2&1 flip rear seat, fold down windshield, 5 panel wink rearview mirror, diamond plate rocker panels, lift kit, custom tire/wheels, front chrome brush guard, stainless steel steering wheel column cover, 6 new Trojan t-105 batteries, powerwise charger included, head lights, tail lights, brake lights, horn, freedom (speed) chip, state of charge meter. 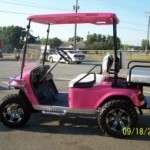 This golf car has it all!! 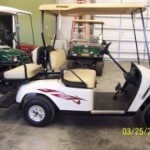 All it needs is a new owner! 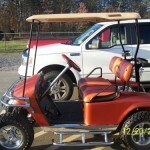 *Harley Davidson Decals*SOLD*2003 Custom E-Z-GO PDS Electric Golf CarSOLD2003 E-Z-GO PDS Golf Car with custom orange/metallic paint, orange/black two tone seats, 2&1 flip rear seat, fold down windshield, 5 panel wink rear view mirror, fender flares, custom steering wheel, stainless steel steering wheel column cover, Harley Davidson decals, 6 new Trojan T-105 batteries, new powerwise charger, Freedom (speed) chip, custom tire/wheels, factory head lights, tail lights. 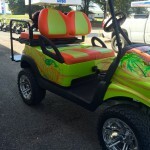 Pictures do not do this golf car justice. Very sharp!! 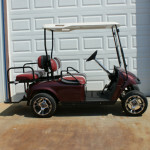 *SOLD*Custom 2003 E-Z-GO Electric PDS Golf Car. 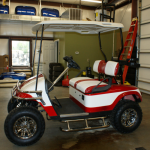 Custom painted body, two tone red/white seat, chrome front brush guard, lift kit, custom tire/wheels, stainless steel steering wheel column cover, diamond plate rocker panels, diamond plate kick panel., billet EZ-GO name plate. *SOLD*Custom 2007 ST 2+2 Red. 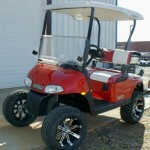 Add custom tires/wheels, chrome brush guard and you have a new look! 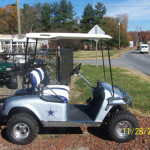 *SOLD** SOLD* 2002 Dallas Cowboy Custom Golf Car* 6 new Trojan T-605 batteries* Custom Silver Paint* Custom Decals* Two Tone Seats*Lift Kit*Custom Tires/Wheels* Chrome Front Brush Guard* Chrome Rear Bumper* Stainless Steel Steering Wheel Column Cover*Carbonfiber Dash* Headlights, Tail lights, Very Nice Golf Car!! 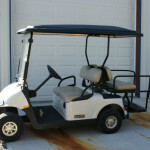 *SOLD**Sold* 2005 E-Z-GO ELE PDS GOLF CAR. 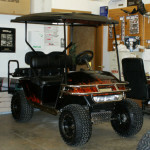 NEW BLACK FACTORY BODY WITH GRAPHICS. NEW CUSTOM SEATS. 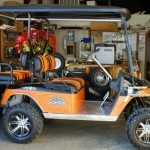 CUSTOM TIRE/WHEELS. 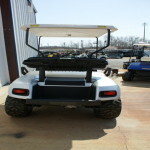 DIAMOND PLATE ROCKER PANELS. *SOLD*Flame Custom body. 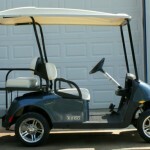 Price will depend on year of golf car. Call for quote. 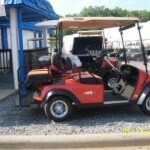 *SOLD**SOLD*2004 ELE PDS. NEW SILVER FACTORY BODY. FOLD DOWN WINDSHIELD. 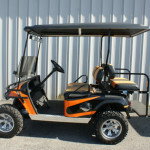 2&1 FLIP REAR SEAT. NEW TIRE/WHEELS. HEADLIGHTS. 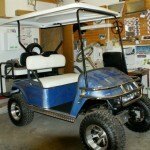 STAINLESS STEEL STEERING COLUMN COVER. 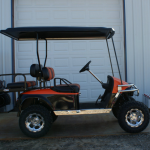 *SOLD**SOLD* 2005 E-Z-GO ELE PDS GOLF CAR*CUSTOM ORANGE/BLACK PAINT*CUSTOM SEATS*2&1 FLIP REAR SEAT*STAINLESS STEEL ROCKER PANELS*STAINLESS STEEL COLUMN COVER*CARBON FIBER DASH*CHROME FRONT BRUSH GUARD*CHROME ITP WHEELS/TIRES*80″ LONG BLACK TOP*NEW BATTERIES*BILLET RECEPTACLE COVER*HEAD LIGHTS*TAIL LIGHTS*MUST SEE!! * SOLD**SOLD*Custom Tomberlin Emerge E2. Two-tone seats. Fairway Alloys tire/wheel. Brand new. 2 yr. factory warranty. Street legal in most states on roads 35mph and under. 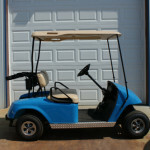 *SOLD*2005 ELE PDS Golf Car with new factory blue body. 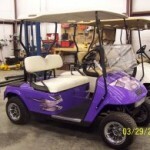 Has custom purple pearl and silver paint. 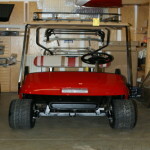 Stainless Steel Rocker Panels. Custom Tire/Wheels. Headlight. Tail lights. 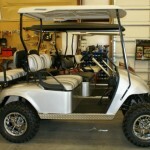 Stainless Steel Steering Column Cover. Titanium Dash. 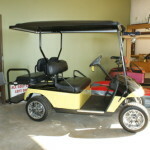 *SOLD**SOLD*2005 E-Z-GO ELECTRIC PDS GOLF CAR*CUSTOM AIRBRUSHED CAROLINA PANTHER PAINT* 8″ LIFT KIT*CUSTOM TIRE/WHEELS*TWO TONE SEATS*2&1 FLIP REAR SEAT*TINTED FOLD DOWN WINDSHIELD* STAINLESS STEEL ROCKER PANELS* TITANIUM HEADLIGHTS AND TAIL LIGHTS*TITANIUM DASH*80″ EXTENDED TOP*FRONT BRUSH GUARD*STAINLESS STEEL STEERING COLUMN COVER*DIAMOND PLATE KICK PLATE* MUST SEE!! 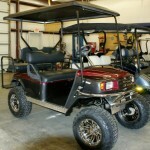 *SOLD**SOLD*2008 ELECTRIC RXV FREEDOM*HEAD LIGHTS*TAIL LIGHTS*BRAKE LIGHTS*HORN*FOLD DOWN WINDSHIELD*6″ LIFT KIT*CUSTOM TIRE/WHEELS*NEW FACTORY DARK BLUE BODY*2&1 FLIP REAR SEAT*CUSTOM SEAT COVERS*FRONT BRUSH GUARD*NERF BARS*TITANIUM DASH*STAINLESS STEEL STEERING COLUMN AND HUB ADAPTER*TITANIUM STEERING WHEEL*80″ EXTENDED TOP. VERY NICE! 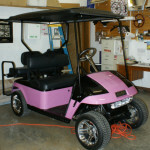 *SOLD*2005 E-Z-GO ELE PDS GOLF CAR*NEW BATTERIES*LIFT KIT*CUSTOM WHEEL/TIRE COMBO*CUSTOM PAINT*HARLEY DAVIDSON DECALS*TWO-TONE SEATS*80″ BLACK EXTENDED TOP*STAINLESS STEEL STEERING COLUMN COVER*CUSTOM STEERING WHEEL*LEATHER LOOK DASH*DIAMOND PLATE FLOORMAT*CHROME FRONT BRUSH GUARD*DIAMOND PLATE FRONT SHIELD, ACCESS PANEL, AND ROCKER PANELS*BILLET PEDAL SET. 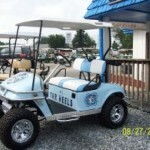 NICE GOLF CAR! 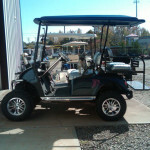 *SOLD*2009 E-Z-GO RXV ELECTRIC*A/C DRIVE*NEW WITH 4 YR. 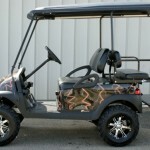 FACTORY WARRANTY* 6″ LIFT KIT*14″ CUSTOM WHEEL/TIRE COMBO* TWO-TONE SEATS*CHROME OVERLAY ON GUAGE TRIM AND CUP HOLDER. 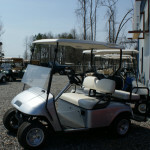 2008 Club Car Precedent Electric*SOLD*2008 Club Car Precedent Electric. 48 Volt. Custom Lightning Bolt Paint. Black Long Top. Head lights and Tail lights. 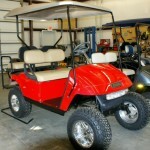 2&1 Flip Rear Seat. Black Seats. 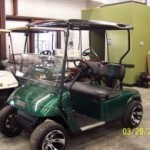 12″ Fairway Alloy Wheels. Charger Included. 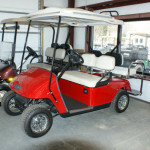 *SOLD*2005 Club Car Precedent Electric. 48 Volt. New Batteries. Custom Painted Body. Black Seats. Fairway Alloy Wheels. Charger and Top Included. 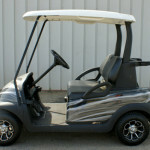 *Sold*2009 Club Car Precedent Electric Golf Car. 48 Volt (Has (6) 8 Volt Batteries). 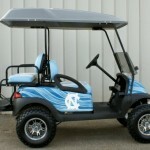 UNC Tarheel Theme. 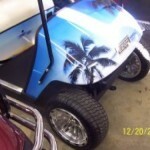 Custom Airbrushed Paint. Head lights and Tail lights. Long Top with moonroof. Tinted Fold Down Windshield. 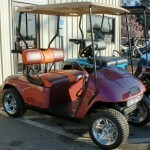 2&1 Flip Rear Seat. 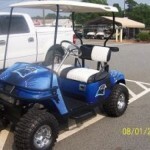 Custom Tarheel themed seats. 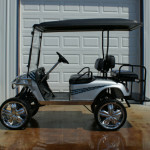 12″ Chrome SS Wheels. Charger Included. 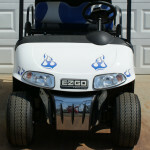 $4,295.002005 EZGO Electric PDS. 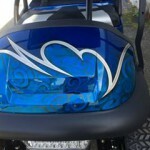 Custom Paint. Long Top.2&1Flip Seat. Two Tone Seats. Tinted Windshield. Lift Kit. Custom Wheels. SS Rocker Panels.Head lights* Tail lights. 2011 Batteries. 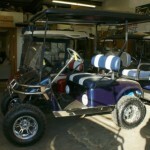 Custom Built Club Car Precedent. 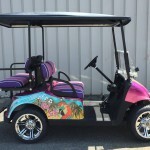 Custom Paint. Lift Kit. 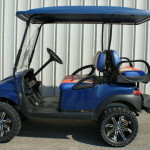 12″ Fairway Alloys Wheel/Tire Combo.2&1 Flip Rear Seat. 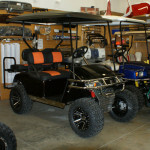 Black Seat Covers.80″ Extended Roof. 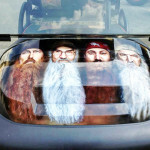 5 Panel Rearview Mirror. 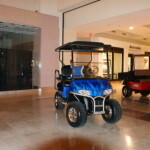 Sweet Ride! 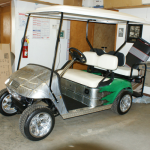 Club Car Precedent with Custom Body, lift kit, 12″ chrome wheels, Max 5 Rear Seat, Chrome Lights, Long Top, It’s Five O’Clock Somewhere Theme Seats. 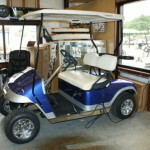 Club Car PrecedentIt’s 5 O’Clock Somewhere! 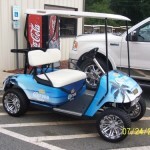 Beautiful Blue Margarita theme golf car! Dead Men Tell No Tales! 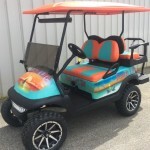 Custom body, lift kit, 12″ Tire/Wheels, Custom Pirate seats, Extended Top, Max 5 rear seat, light kit, Pirate theme tinted windshield. 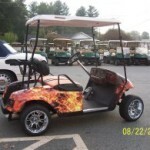 We provide our amazing custom golf carts to clients in Hickory, Taylorsville, Newton, Conover, Lake Hickory, Maiden, Claremont, Bethlehem, Statesville, Troutman, Morganton, Boone Blowing Rock, Wilkesboro, Mooresville ,Charlotte, Lake Norman, Granite Falls, Lenoir, Shelby, Lincolnton, Denver, Davidson, Huntersville & Cornelius, NC!